Why growing vegetables even in small spaces can transform your child’s eating journey from bumpy to a smooth ride. Listen to the latest podcast episode with Charlotte who is a gardener and garden designer. She shares practical tips about growing vegetables in small spaces with your kids. She’ll teach you the easiest vegetables to grow with your kids using amazing tips to introduce and get your children excited about growing vegetables. 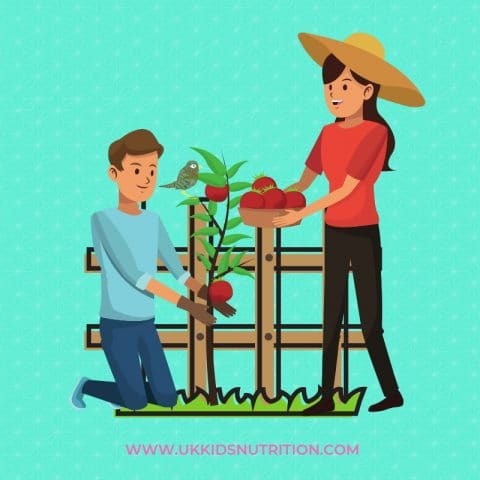 Research suggests that children who grow their fruit and vegetables are TWICE MORE LIKELY to eat their recommended five servings of fruit and vegetables per day. Gardening and growing vegetables is a simple and effective way to encourage children to eat their fruit and vegetables. The future’s more likely to be positive if you are able to sneak in some gardening time with your children. 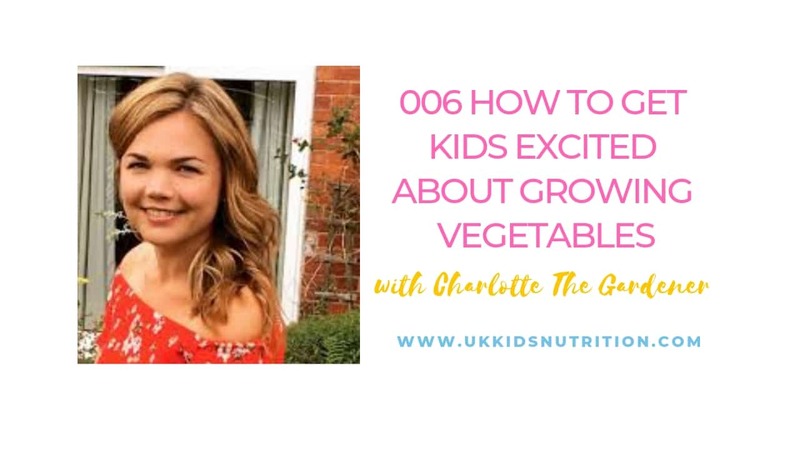 And it will be even better if you complement growing vegetables along with regular appointments with your paediatric dietitian to transform your picky eater into a food explorer. Charlotte first got into gardening when she was suffering from postnatal depression. And that’s how she got her first gardening job. Plants that look great on balconies are strawberries which are really fun and really easy to grow. Visually they look great hanging down over a basket on a sunny window ledge or next to other plants sitting on the balcony. Similarly growing vegetables like cherry tomatoes in a basket look really pretty as well. Tomatoes are great to grow with kids because if you can find its seeds they germinate really quickly. Within a couple of weeks, kids can watch it transform and then every day they’ll be able to see a significant difference in how much they grow. Charlotte created an Instagram post about a week ago because even she was amazed. She had them on her kitchen window sill and enjoyed looking at them every day. She couldn’t get over how fast they were growing. Kids enjoy being able to see transformation happening quickly. They’re impatient and they want to see their fruits of labour growing quickly. So growing vegetables like cherry tomatoes or strawberries offers a reasonably quick win. A pot, seed compost or multipurpose compost, cherry tomato seedlings, a seed tray, a pair of gardening gloves, a trowel and a fork. Once at least 3-4 tiny green leaves appear, the seedlings are ready to be transferred into a pot. Using a pencil, delicately lift it up by the tiny edge of the leaf, scoop it out and pop it into a pot on its own. If you do this in April, leave it in the pot for about a month until its warmer. During this time, keep transferring it into bigger pots until you are using 12-inch pots. It can be displayed on the balcony or grow it indoors. Bonus tip: cherry tomatoes are attractive plants and smell delicious too. Don’t worry if you get it wrong. You’ve just got to try things and if you make a mistake, then you just learn how to do it differently next time. 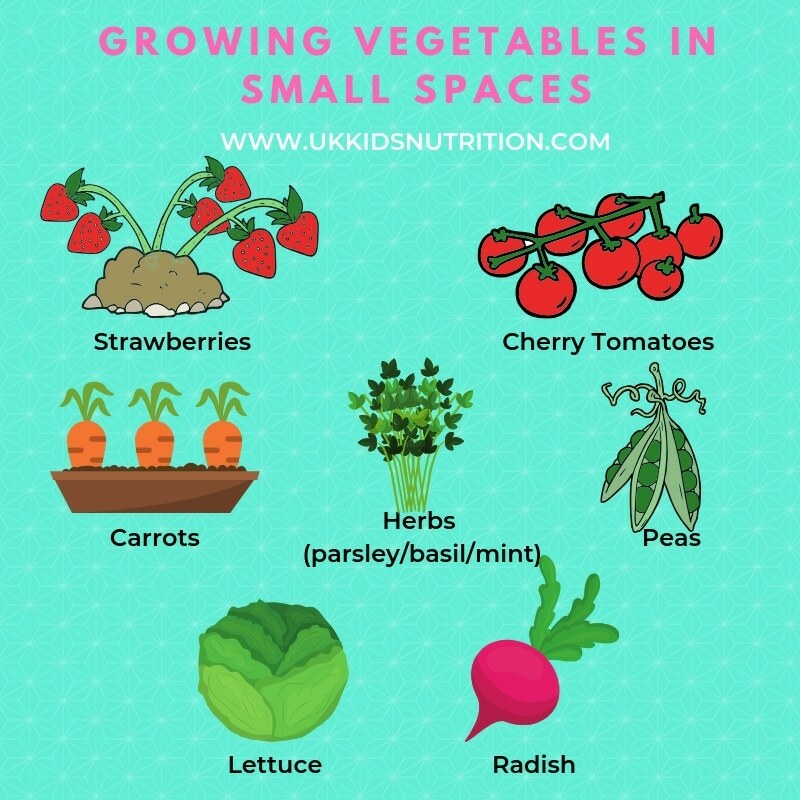 If you are planning on growing vegetables with your children, another great vegetable to grow in small spaces are peas. When you pick the pod off a plant, break it open and eat the fresh pea raw they are absolutely delicious! For children to see where peas come from, it’s fantastic. 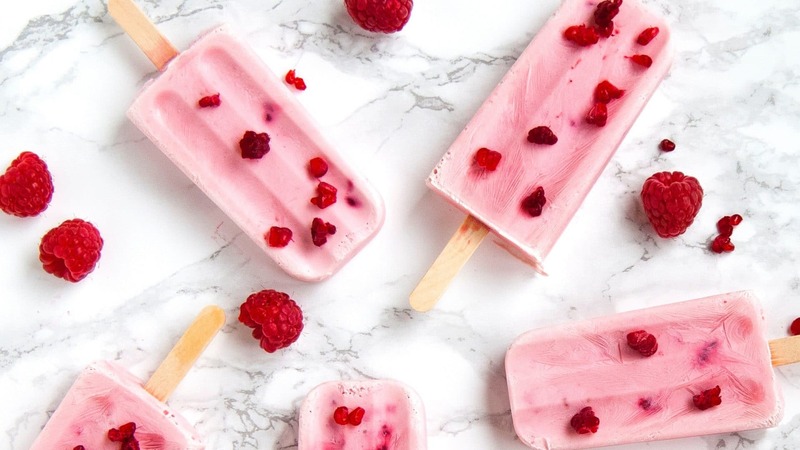 Not only does it taste sweet, kids won’t believe that it’s the same thing as the bag of peas in your freezer at home. Charlotte recommends involving your children with growing vegetables as early as possible. I couldn’t agree more. Charlotte’s son has been out in the garden from quite an early age. He was quite happy to as well. He loved getting his hands dirty in the soil. It’s one of the nice times that you can enjoy being outdoors without worrying about keeping their clothes clean. To get kids excited, ask them to bring along their favourite toys such as trucks, buckets and spades. Give them little jobs to do such as pulling out weeds or fetching items for you. Kids love getting involved and they love having jobs to do which makes them feel important and part of the gardening project. Charlotte recommends getting them engaged by letting them touch the soil, talking about the plant, smelling these and describing the different smells (think lavender)! Toddlers as young as three or four can help with planting seeds. Tomato seedlings might be too small to be handled by young children, but sunflower seeds are perfect as these are large enough for children to hold in their hands. 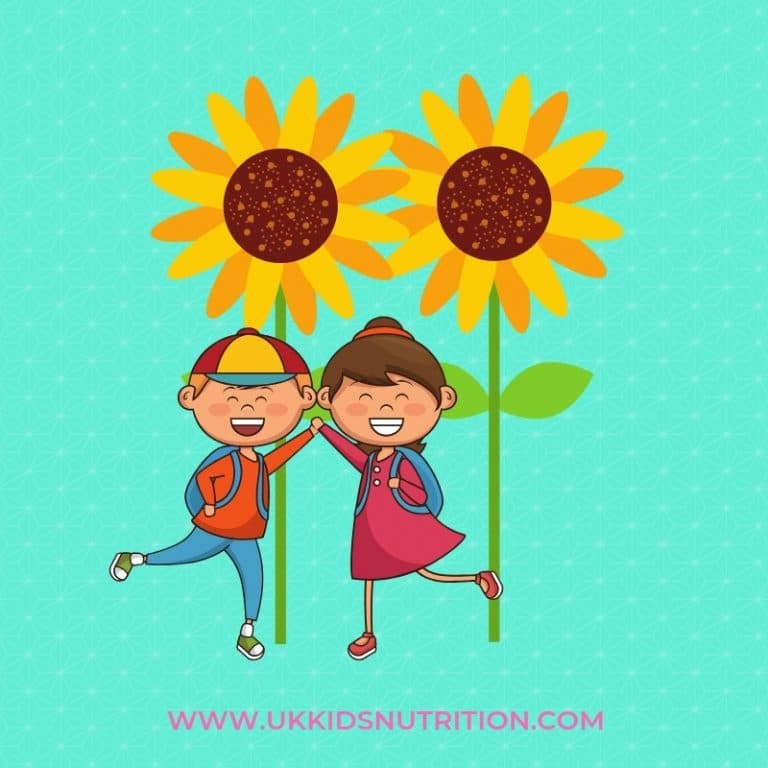 If you have more than one child or if your toddler has a best friend, invite them to plant a sunflower plant each to see who can grow the tallest plant. When the sunflower head dies and falls, ask children to look at its interesting pattern, talk to them about how the seeds go round in a circle. If they enjoy art, ask your child to try drawing out the pattern and discuss the transformations of how the seed grew into a tall iconic plant with beautiful bright yellow flowers. If you are planning on growing vegetables like lettuce with your children, make sure that you choose a window sill that receives lots of natural lighting. If the plant starts to lean heavily towards the window, then turn the plant around to help them straighten up. With the exception of seedlings, keep your pots away from windows that have radiators sitting underneath them. Plants generally don’t like direct heat from radiators. Supermarket herb pots are not designed to last long. If you do buy a herb pot, after discarding the small plants, look for four to five of the “healthy” plants with its roots attached and then transfer it to a new herb pot. When it comes to watering, over watering is probably one of the main culprits for killing supermarket herb plants. Questions from social media followers. Charlotte recommends lifting the older plants and using different planters like barrels or pots with holes in them for strawberries to poke through. Also consider stacked terracotta pots or invite the children to decorate the plant pots. To get kids really excited about gardening, use insect hotels or homes, their favourite toys and lots of creativity in the garden. For guidance on how to look after your dahlia plants, orchids and tips for growing different types of mint, listen to the full podcast episode here. YES PLEASE! I'D LIKE TO BOOK A FREE CALL.